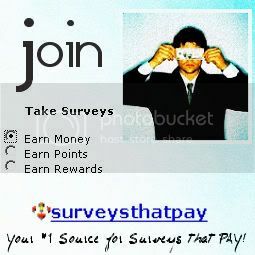 Your #1 Source for Surveys that PAY! Blingo is a search engine, powered by Google, in which simply performing your daily searches can garner you goods — things like iPods, PSP, iTunes gift cards, VISA gift cards, and more. To join Blingo you don’t have to give away any personal information at all (until you win — then you’ll need to tell them where to ship your prize). You will have to provide your e-mail address, but they won’t sell it to other parties. If you’re going to search the Internet, why not get FREE stuff for it? Once you join Blingo, you can increase your chances of winning by inviting your friends to join and use Blingo. When one of them wins a prize you win the same prize! That means if one of your friends wins an iPod, you win one too. How awesome is that? MyPoints.com is a credible site. I've been a member since 2000. While this is not a "survey site" it is a place where you receive rewards. You can earn points by shopping online, (usually 5 points per dollar spent) or you can earn points by receiving MyPoints Bonus E-mails, This is where you earn 5 points for reading the e-mail and visiting the website the e-mail is advertising. Pretty simple. If you shop a lot online, you'll accumulate points much faster than if you don't. MyPoints has a large list of online merchants for which you can earn points while making online transactions (i.e., shopping). Some of the stores where you earn points for shopping at are Barnes & Nobel, Target, Gap, Best Buy, and Wal-Mart just to name a few. However if you're like me, who doesn't do much online shopping, then it'll take you a little bit longer for your points to add up. Though, do not fear, your points will accumulate. Once they do you'll be able to redeem them for free gift cards at over 70 name-brand merchants. Just recently I redeemed my points for $110 in Web Gift Certificates. In the past I've also redeemed my points for a $50 Tower Records gift card. MyPoints.com is incredibly fast at sending your reward. I've also had a positive experience with MyPoints customer service. They've always been more than happy to answer any concerns or questions I've had. Would you like a MyPoints referral? If so, reply to this post, leave e-mail address along with your first and last name and I'll send you one! Be sure to put "MyPoints Referral Request" in the subject line of your e-mail. ***Note: ALL replies are screened! I have found a place where my opinions count. I joined Opinion Outpost and I think it's a great place to give feedback and earn some cash. Membership is free and your information will always remain confidential. In order to join & participate you have to be at least 18 years of age & live in the United States or Canada. Make sure you put "Opinion Outpost Referral Request" in the subject line of your e-mail. SurveySavvy is a reputable site. Once you become a member you earn money (not points) by taking research surveys online. They pay good money! I've always received my cash (checks) quickly. Want to know another plus about SurveySavvy? Like many survey sites, you can also earn money for referring your friends! How awesome is that? The SurveySavvy payment system pays you an average of $2 every time a member you refer completes a survey and an average of $1 every time a member they refer completes a survey.